Students work at Ellie's Garden, one of a series of gardens at UC San Diego's Eleanor Roosevelt College. The University of California now produces more on-site solar energy than any university in the country — drawing enough sun power to light up a small city. More is on the way, as UC stretches to become the nation’s first large university system to achieve carbon neutrality and move to 100 percent clean electricity over the next six years. In the late '60s, for example, UC Davis students launched a public bus system, and UC Santa Cruz students started one of the first organic farms. Both efforts went on to become models for other universities. More recently, UC students pressed the university to adopt clean energy policies and green building practices. 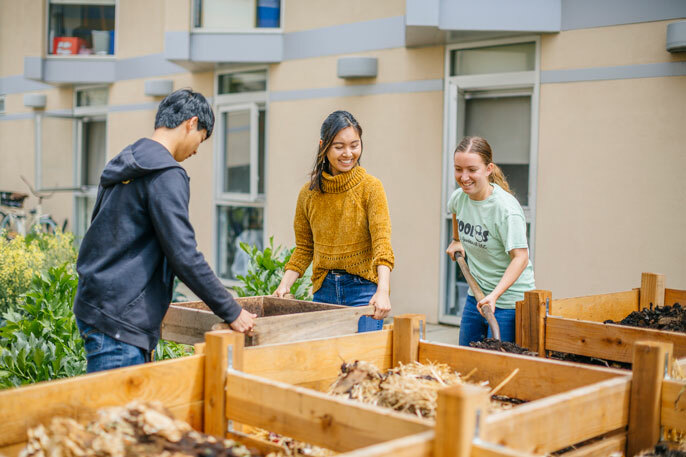 Their persistence paid off in 2003 when UC enacted its first universitywide Sustainable Practices Policy, which set operational standards in areas including climate, energy, food, transportation, water and more. A tree at UC Davis is tagged to reflect its carbon and financial impact. The goals have become increasingly ambitious over the years. Today, UC is looking to zero-out its carbon footprint, divert 90 percent of its waste from landfills, and use only clean electricity by 2025. You can track its progress in the just-released Annual Report on Sustainable Practices. Students who get involved in environmental activism during their years on campus often find that their passion for the work opens doors to unexpected professional opportunities, leading to even greater impacts, Phillips said. Case in point: Ten years ago, UC Santa Barbara alum Logan Green helped organize the first student fee referendum to provide funding for student‐led sustainability projects. Today, students at eight UC campuses support sustainability projects through similar mechanisms. In 2018, those efforts raised $2.2 million for student-led projects, and allowed UC Irvine to become the first university in the nation to convert its full bus fleet to electric buses. Meanwhile, Logan Green — who as a student became focused on solving the problem of clogged freeways — went on to co-found Lyft. The ride-sharing company pledged last year to make all of its rides carbon neutral. And the person helping Lyft achieve its promise? UC Berkeley alum Sam Arons, who met Green back in 2006 when Green helped Berkeley and other UC campuses pass their own student fee referenda for green funds. Read more in the 2018 Annual Report on Sustainable Practices (PDF).